I came across an entire CASE of these Idaho Spuds at work. Turns out my boss was given a case of them as partial payment for photographing a wedding (the bride was from Idaho) and she (my boss) couldn’t possibly eat that many, so she brought them in to share the wealth. I had heard of these before as a classic candy I absolutely must try, but never had the change to. Now I am a HUGE fan of potatoes, in almost all of their forms, but I am not a huge fan of this candy. 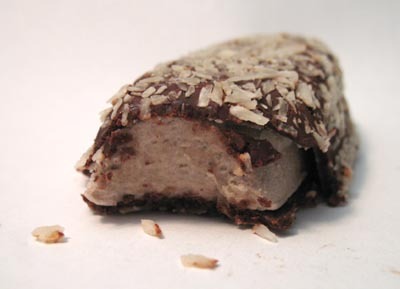 Consisting of a cocoa-flavored marshmallow center, covered in chocolate, and sprinkled with coconut shavings, the bar just didn’t do anything for me. With the bar I had, the outer chocolate shell was separating from the inner marshmallow, and shedding everywhere. I decided to jump right in and took a huge bite out of one end, and immediately went to get a drink. I couldn’t finish it off, and I always try to finish a candy I review. The marshmallow is very slimy, and the consistency left much to be desired, very sticky and broke off in pieces like Silly Putty. 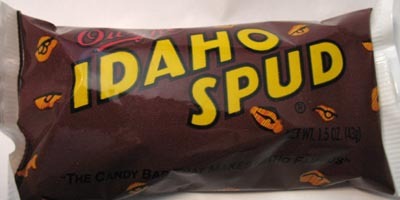 The Idaho Spud has been in production since 1918, so someone must like them. I don’t. Ugh, I totally agree with you David. When I tried this one a few weeks ago, I was horrified by how bad it was. I hate saying bad things about candy…but this one was just awful. Now I have to try one just to see how bad it is! Your photos capture it all so well … the mockolate won’t even stick to the weird latex marshmallow. Oook! I seen these featured on the unwrapped food network channel and I ordered some to try. I couldn’t even get through one bite, it was horrible. My husband loved them. So needless to say, I will never purchase them again. First, Cybele is just plain wrong. Neither Mock nor ‘latex marshmallow’… poor presentation isn’t due to quality of ingredients, it’s more about a process dating back so damn long it predates even *caring* about, let alone knowing how to engineer this sort of thing. 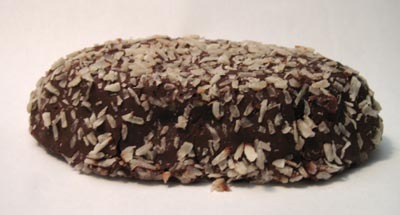 A spud bar doesn’t cheat the ingredients; it *is* chocolate, coconut, and whipped (mumblesomething). As cloyingly extreme and unbalanced as this candy is, there’s no need to go into character assasination, C. Please, don’t think I’m getting defensive. I’d nominate a spud bar for this site’s top-ten worst candy list in a heartbeat. I’m just saying it does that without cutting corners, it ain’t cheating on ingredients that gets the spud bar my vote. Now… for the mystery of WHO BUYS THESE THINGS?! 1 – tourists. Something like a million people a year go to Yellowstone, most pass thru this area. 2 – tourists with a sadistic streak toward people they’ll gift them to. Thus, the repeat customers. 3 – locals, same sadistic streak. 4 – a tiny niche of adherents or fans: when I worked back east, a buddy found out I was from Idaho and had me bring several back as a repeat gag gift for his family on christmas. One per stocking. He then mentioned that they’d all end up eaten by his brother, who thought they were *awesome*. Me? When I get one, I cut it into about 6 or 8 pieces, and nibble my way thru with some rich, strong, dark-roasted *black* coffee. They’re not bad if consumed this way; coconuts, chocolate, sugar, and coffee. Oh, and that’s about the only time I take my coffee black, to give some context. Nice site. Hopefully, I’ll be back. I also ordered this candy after seeing it on unwrapped. Mine also ended up in the trash. i personally love that odd texture. i live a mere three hours from aplets and cotlets and they are probally, well most definatly more delicious than the spuds. my favorite are the pineapple. but stay away from the sours gross. Now I happen to be from Idaho, and was raised on these things…I admit they do have an odd texture, and are messy to eat, but we like them. But after all, there are people who eat chitlins…so how bad is this in comparison. I was born and raised in Idaho and I love Idaho Spuds. We spent 22 years in the military and always got a “care package” from home which always consisted of at least two boxes of the famous candy bar which we shared I never had anyone tell me they didn’t like them. wow, people don’t like these?? I LOVE them. We would always get them when we went to Idaho for family reunions. Now that I live in Utah (which is the only other place I know where you can get them easily) I eat them every so often. Had 2 this week :) Had fun and sent a box of them home to my family in CA…they were thrilled. *Shrug* more Spuds for me! Well – I just read all the comments ! I actually like them !…….because I detest peanuts. When I came to the USA to visit ( I live in New Zealand) a few years ago and wanted to buy a candy bar, I could not find one without peanuts in it. Yuck. Finally found the Idaho Spud on a store shelf and read the label – no peanuts – so ate those while visiting. Sure wish I could buy them here. I love Idaho Spuds!! Always have – always will. Moved away from Idaho over 20 years ago but still buy them by the box when we return to share with my favorite people. I’ve never had anyone refuse one – and many request to be on the receiving end if/when they know I have them. They’re a flavor blast to my past and this senior citizen will be a fan forever! I have lived in Idaho my entire life. The only joy i get from them is telling my out of state friends how good they are and then watching them try one. Its good for laughs. I have never been able to finish one of them. I guess if they were the last thing edible on the planet I would eat them but I probably wouldn’t survive long. I have lived in California all of my life. When I was a little boy back in the 70′s, I first encountered these strangely textured candy bars. For whatever warped reason, they actually appealed to me. I’m now in my 40s and a wonderful candy store (Powell’s Sweet Shoppe) recently opened in my area. Powell’s carries all sorts of wild candy and other sweets that you haven’t seen in years. It’s just a mind-blowing nostalgic paradise. Anyway, they have Idaho Spuds there. I was DELIGHTED to know end and have found that others in the area –for whatever reason– also seem to like them because the store can’t seem to keep them in stock. Although not exactly what I would call “good”, I somehow LOVE these weird little creations (that look more like hairy turds that potataoes to me). YUM!!!! You’re supposed to freeze these. They’re not as good if you don’t. I actually really like these things. Born and raised Idahoan. Grew up on these. My dad still keeps these in the freezer and I still sneak some when I go to his house. In next few weeks, gonna order some containers of the bites :) love them.